Traveling around Indian cities, it’s as if both the farm and the zoo have been unleashed. We have seen such a crazy range of animals wandering down the streets. Camels and donkeys pull heavy carts of bricks, logs, and produce. Brightly painted elephants slowly make their way down the road with tourists awkwardly riding on their backs. Oxen muscle their way through narrow alleys, stopping rickshaws and re-routing motorbikes. Huge pigs nose through the trash while their piglets try to nurse. Monkeys scale apartment walls and bypass crossing streets by flying through the air, making a jungle gym out of the hundreds of hanging wires and cables. And everywhere we go, cows mosey along, stopping traffic, and serving as an entertaining nuisance. While cows are not necessarily considered sacred, nor do they lead spoiled lives, Hindus regard them as the source of food and symbol of life. So they may not be killed or eaten. But they do get to rule the streets. 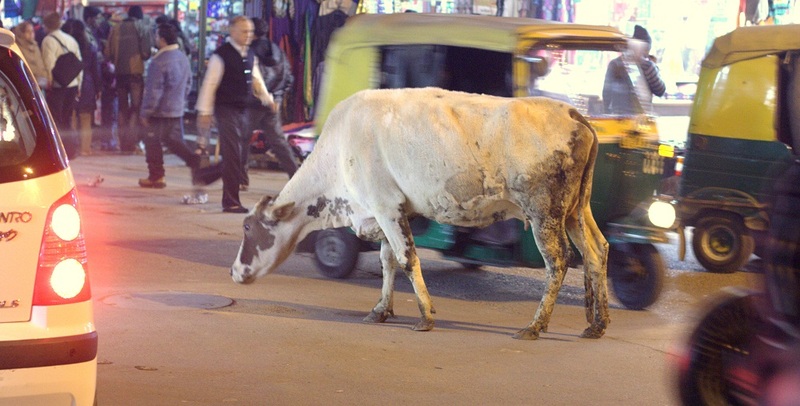 Our first encounter with this phenomenon was in Mumbai where we witnessed people paying money to feed a cow while on the other side of the street a woman begged. In Jaipur we saw a huge cow curled up in the median of a busy street, unperturbed by traffic honking wildly on both sides. In Delhi we spotted one standing in front of a little street shop, eying the treats and lined up as if she was just another paying customer. In Pushkar a begging woman gave some of her orange to a cow! One morning we saw a cow stick her head into a bucket of tomatoes on the back of a produce cart and cheerfully munch away until the cart man came back and sent her on her way. Within ten minutes another one with big horns had the audacity to make way for my bowl of fresh fruit before I “tisked, tisked” him and gave it the cold shoulder. Written by: kate on February 3, 2012. I don’t remember seeing any cows but there were a fair number of water buffalo. Maybe in Thailand indeed!